Professional Rubbish Removal in Greenwich. You really need help to clean out your garage from the old tyres and all the old furniture stuffed in it? Why not take advantage of the professional rubbish clearance service offered by Thomsons Cleaning expert company? We are professionals with over a decade of experience of helping the businesses and the people in Greenwich SE to get rid of junk and unwanted stuff in an appropriate manner. We can help you with the process of cleaning your property out, loading the unwanted stuff in our vans and disposing of them in a legal and environmentally friendly manner - all this at an cost-effective rubbish removal price. Get a totally free price estimate, or ask for a absolutely free viewing for a price quote at our non-stop phone 020 3746 0000 or online here. You may book a couple of our cleaning and maintenance services in Greenwich SE at a time. This will save you time and money, because we offer big discounts for combined booking. Rubbish removal can be ordered with various other services. For example, after you order house clearance, you may order one-off or end of tenancy cleaning of the emptied house. Also, you can order garden clearance together with our professional gardening service. The builders waste clearance is completely suited with our expert after builders cleaning service, and so on. To declutter your property legally, quickly and at an affordable price, book our junk clearance and disposal services today. We from Thomsons Cleaning are among the top preferred rubbish removal firms in Greenwich SE. 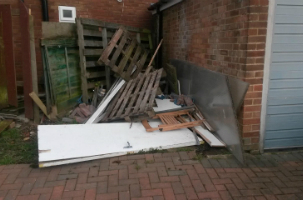 The reason is that we offer professional, highly efficient, hassle free and affordable clearance and rubbish removal to all the domestic and commercial customers in the area. We can handle any kind of junk, with the exception of medical products, chemicals, hazardous materials, paint or food. We handle all of the waste in accordance to the requirements of the United Kingdom and European Union directives for waste management. We can clean out your: garage, loft, house, office, shop, garden, and we can dispose of: refurbishment builders waste, furniture, garden waste, old tyres, IT and any other unwanted items you have for you. We will do it quickly and at a great price. The proper disposal of various items will save you from possible fines for disposing of them inappropriately. When you purchase a absolutely free viewing in Greenwich SE, our waste removal technicians will arrive on the spot and will perform a detailed inspection. They will give you a price estimate for the work required depending on the volume and type of junk you want cleared out or disposed of. If you agree with the price offer, they will start clearing out and loading the junk into the van quickly. All of our operators are trained and experienced to work promptly efficiently and safely. Once the junk is loaded into the van, the operators will transport it to the nearest appropriate disposal site, and will dispose of it in an eco-friendly and legal manner. Order a free viewing and book our junk removal services in Greenwich SE by simply calling 020 3746 0000 or filling out the online booking form. The customer support operators are at your service non-stop, so contact them at any hour. You will receive a text message and e-mail confirming your booking. The viewing is free, so if you don’t agree with the offer the operators make you on the spot, you are not obliged to pay them anything. If you like the offer, they will start clearing out or loading the unwanted things immediately. You will get a big discount if you combine several of our cleaning and maintenance services. Estate agencies, landlords and regular customers will get preferential prices. No deposit is required for booking, so book us now!